You better grab the tissues, because this story of identical twins who were separated at birth meeting each other for the first time is about to wreck you. 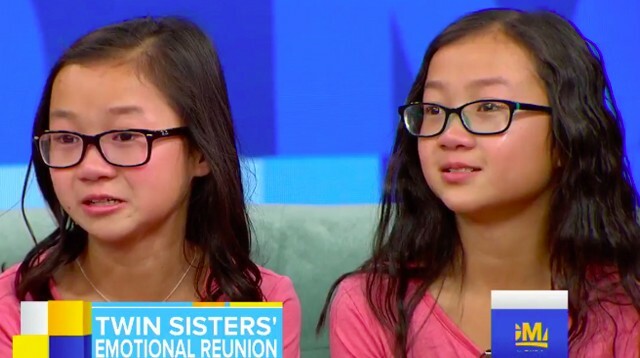 After being adopted by two different families as infants, 10-year-old identical twins Audrey Doering and Gracie Rainsberry came face-to-face for the first time on Good Morning America this Wednesday, and there wasn't a dry eye in the house. As the show explains, the twins were born in China before Gracie was adopted by a family from Washington and Audrey by a family in Wisconsin. However, both families had no idea of the other twin's existence until one day, Audrey's mother Jennifer Doering came across a photo of her daughter sitting on her foster mom's knee—next to a baby who looked exactly like her. "As soon as I had that picture, I was desperate to find out...who that other child was," she said. "Oh, it was unbelievable. I'm like, 'How?' I mean, this is stuff you read about. And how, how could it really be that there are two of them?" With the help of an investigator, Doering was able to uncover the fact that her daughter had a twin sister—and thanks to Facebook, she was able to find Gracie's mom, Nicole Rainsberry. The rest, as they say, is history. While both sisters didn't know what to think about the whole ordeal—Audrey apparently thought her parents were playing a trick on her—when they met in person, their bond was undeniable and the emotions immediately started flowing. And as they quickly discovered, they have a lot in common, including things both serious and more trivial: Both had heart conditions growing up and have a love for the same foods. "It's very overwhelming," Gracie said. "It felt like there was something missing, so it was like, now it's complete," Audrey added.